MMS OCTOBER 2018 88 mmsonline.com CREEP-FEED GRINDING profiles that match the profile of the grinding wheel. (See photo on page 85.) • Special coolant-collection tooling is used in creep-feed grinding. A ramp on the exit side of the part collects coolant and enables it to pool at the wheel for still greater wheel exposure to the f luid. This ramp might even be machined to match the part profile. 5. Down grinding is the way to creep-feed. Similar to milling in which the two possible direc- tions of tool rotation relative to the workpiece produce either conventional milling or climb milling, the two possible directions of grinding wheel rotation produce either "up" grinding or "down" grinding. Dr. Bright says creep-feed's pref- erence is down grinding. The rotation of the wheel should cause the bottom of the wheel to move in the same direction as the feed of part against the wheel. This type of grinding causes any point of the wheel—any grit of the wheel—to first meet the workpiece where the material engagement is greatest. (See diagram on facing page.) Again, heat is the reason for this. To grind in the other direction is to have the grit first meet the material without cutting into it. "The result is you're not making a chip right away," Dr. Bright says. "Initially, the sliding and plowing is just causing fric- tion." Down grinding, though it might seem more abrupt, allows for machining with a wheel that is cooler when it first begins to remove material. 6. Intermittent dressing is becoming more acceptable. Because the material removal per pass is so great in creep-feed grinding, aluminum-oxide wheels used in this process tend to require contin- uous dressing. 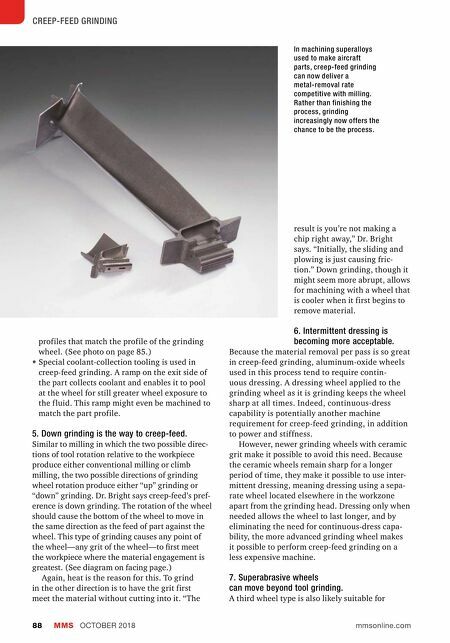 A dressing wheel applied to the grinding wheel as it is grinding keeps the wheel sharp at all times. Indeed, continuous-dress capability is potentially another machine requirement for creep-feed grinding, in addition to power and stiffness. However, newer grinding wheels with ceramic grit make it possible to avoid this need. Because the ceramic wheels remain sharp for a longer period of time, they make it possible to use inter- mittent dressing, meaning dressing using a sepa- rate wheel located elsewhere in the workzone apart from the grinding head. Dressing only when needed allows the wheel to last longer, and by eliminating the need for continuous-dress capa- bility, the more advanced grinding wheel makes it possible to perform creep-feed grinding on a less expensive machine. 7. Superabrasive wheels can move beyond tool grinding. 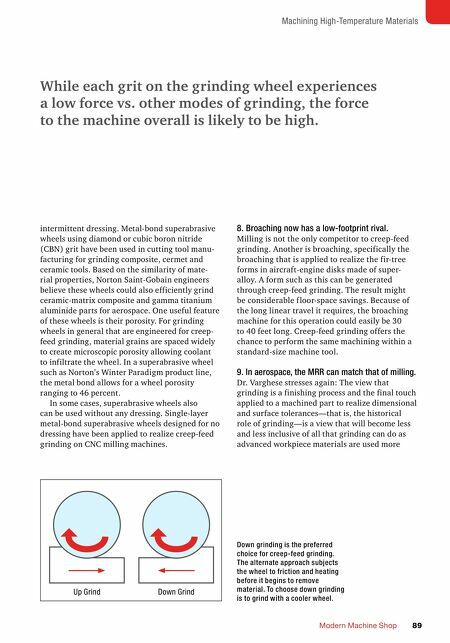 A third wheel type is also likely suitable for In machining superalloys used to make aircraft parts, creep-feed grinding can now deliver a metal-removal rate competitive with milling. Rather than finishing the process, grinding increasingly now offers the chance to be the process.